A colourful preparatory mail from Praveen set the tune for a wonderful experience of one day rainy trek to Tada hills. With mails clarifying who what when and how all of us were ready by fri night. Sat evening met Vetri in whose car Jayeetha (excited newbie), Vinoth (a regular – one of the super singers during the trek), Inayath (another regular & photographer) and myself met the rest of the team at STATION 1 – Toll gate, after passing through terrible traffic (Diwali season – what more can we expect) but killing time with intro’s, discussing about few earlier experiences, CTC events, etc. With hi and helloes to old friends, transaction with trek accountant Bency we all set to second destination STATION 2 – Dinner (phew…finally). Here with small shuffling in the car met super dad Hemadri who joined the trek to accompany his 11th grade kid. After a good dinner all the cars zoomed to the base camp for the night – STATION 3. On the way we stopped middle of some lonely road between the fields to wait for Arun to join us. All of us got down the cars to enjoy the darkness and silence of the starry night. Here some were reading stars, some others were chatting and having fun. Our “dormitory” for the night was a small concrete construction surrounded by short wall and roofed by asbestos sheets. Most of us fitted in the “dorm” while a few settled in their cars. Inspite of efforts of the boys to prevent rain shower and help us sleep dry by tying tarpaulin sheets, rain found its way from the roof. After some more confusion we let sleep takeover. NO ODOMOS NO SLEEP warning was so true.. LL. It was a night of mosquitoes and rain. Still i managed to doze off for a few hours. A loud wakeup call by someone managed to replace alarm noise. Unlike at home could not snooze alarm as everyone around were getting up (boo hoo)… But the cool breeze did the magic. After freshening up in the chill winds’, packing my bag was ready for the days adventure. Another short ride on wheels, breakfast of bread, jam and milkmaid we marched to conquer the hills waving bye to a new group of monkeys. We crossed a small dam filled with water few inches below. From here we were to join the jeep trail – a route made some centuries before. 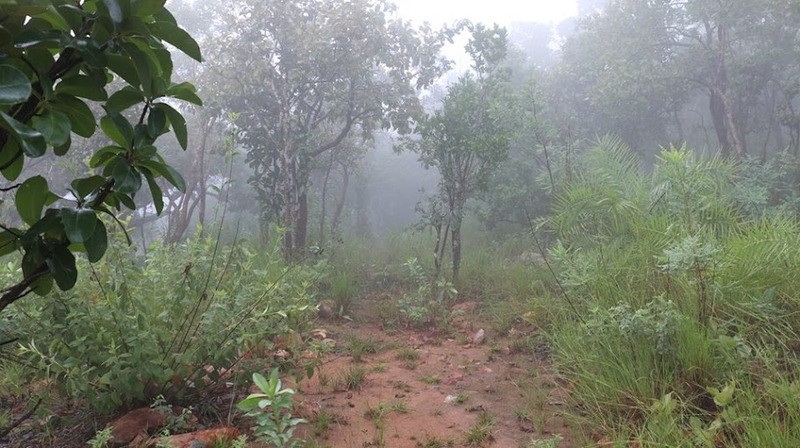 It was search of this jeep trail which led the team onto many stony route. Within a few minutes of climbing rain god blessed us with his showers, actually his downpour. Blessing was so much that he took very few breaks. Those with rain cover protected themselves well and others like me without one boasted that we are “enjoying the rain”… Whatsoever half way through the trek everyone were soaked in rain. The hills were as always at its best… Cloudy skies, fog spread over on all sides, trees looking fuller and greener with the downpour, the rocky climb was a luxury. The beautiful sceneries like, view of the lake or misty mountain slopes as we were climbing ‘kindled the singers in Vinodh, Bency, Joyful Joy who claimed he was singing too 😉 😉 and few others. We stopped here and there for small breaks when organiser and his co-team of so many sped forward to decide the route. The rest of us were enjoying kadala mittai, chocolates, pickle or posing for photos which Inanyath & Ganesh managed to take when rain took a break. Based on my energy levels I was either humming along with the lead team or hopping with the sweep team. After loads of climbing we were allowed to break for lunch and enjoy our poli while Arun, Karthik and Iron man-Jebin went still further to explore the route – maybe end of the jeep trail!! Rain allowed us to chit chat, take some rest and few to meditate for a while. Post lunch we were heading to the origin of Tada. The downpour got to life a very rare waterfall which can be seen only when there are heavy rains – we happen to be lucky ones here. 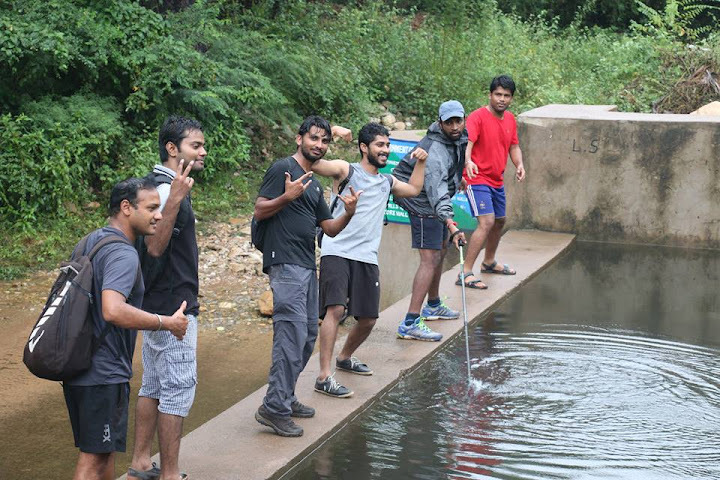 We passed through the streams leading to the falls, doing water trek combined with some slipping and tripping too. A beautiful pool invited some of the swimmers to showcase their skills. But the team was pulled away quickly promising a much better main falls. With helping hands of Dinesh, Vibin, Ramesh, Arun, Naga, Atul and many whom I was passing by managed to reach the much awaited Tada falls. 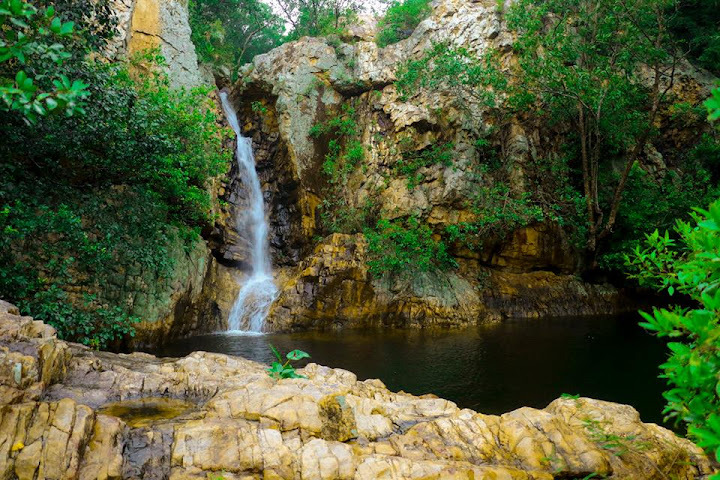 The sound and view of falls was itself an energy booster. As promised the sight was so picturesque. The expanding stream which we walked over poured into a small pool into which few of our dolphin friends jumped and swam as others cheered. I being non swimmer relaxed my legs on another stream gushing out of the pool to experience water massageJJ. After a short while Praveen managed to disburse the crowd to descend. Completely dripping both in falls and the rain, shivering in the cold wind our team started to descend trying to rush down before the day light disappeared. By 7 our path was fully dark – time for night trek (even more exciting part). Emperors Tada express now formed one straight line (one arm distance too) led by Karthik – The (Shathabdhi) Engine of our (passenger) train followed by myself (speed regulator of the journey – even tying lace was going to halt the entire train.. hee hee) followed by Sanket, Joy, Inayath and Naga all of us part of first coach and last coaches were mostly the fast boys. The train cooed down the hill holding each other hands and lit by torches at regular intervals which gave scarce light to a few and others hidden in darkness. With sudden breaks whenever any of us slipped over the slippery stones, pebbles, boulders and what not; screams asking to slow down; and a few hair pin bends, Emperors Tada express managed to reach the base station. Hurray mission accomplished.. Cheers and hoots followed. How can I miss to mention – I saw fire flies.. The moment we understood where we were going the train split and all of us walked tiredly towards the parking area with a sigh of relief that the team was not going to spend diwali on the hills. The small dam which we crossed in the beginning was overflowing now – witness of the day’s downpour. We ran inside our cars to halt only to change at STATION 3 – The dorm. Next destination was dinner point. Our car missed to join the rest of the group. Hungry tummy took us to a dhaba which called itself Family Restaurant. Hot tasty food was the pain killer. With another halt for some car shuffling, waving bye to everyone I joined another Vibin and team to head home. On the whole Tada express was a wholesome package of monsoon trek, waterfalls, night trek, lost routes, misty mountains, chill winds for an excited team. Thanks again to organizers Arun, Praveen and Co; engine Karthik to guide us down; so many helping hands on the way; Ganesh & Inayath for lovely clicks to cherish the experience; Bency Rani for accounts; car owners who rode us back even after a tired trek; bringing Bread & Poli for BF & lunch; and the entire sooper tada express passenger friends. 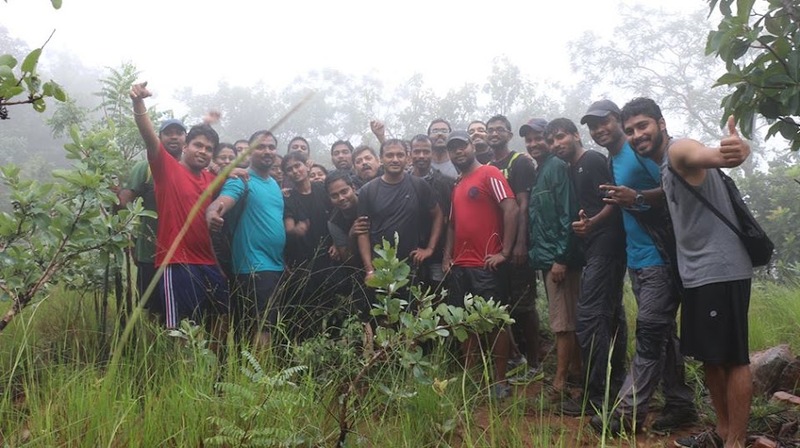 When Chennai waspreparing for its monsoon and Diwali, a group of 33 people were getting ready to reach the zenith of TADA. Loads of mails piling up on the eve of 7th from Praveen about volunteering and with the same zeal we started from Chennai the next day and met our mates at Ambattur Toll. After a brief introduction we were on our way to reach the base with a dinner break. We entered TADA and were waiting for Arun to join us while we had a glance of the beautiful starry sky which increased our energy level. Moving on to the base and some initial accounting was done by Bency. Meanwhile all of us unpackedand were about to have a nap when the rain started pouring. Before we even realised that we were getting drenched from the mazhai saaral, the guys of our team in a jiffy covered the sides of the base with tourpoline sheet which made us have a sound sleep. That marked the end of day one. The next day started at 5.45 a.m. Girls started packing lunch.After 10 mins drive from the base we reached the parking lot from where our trek actually started. We were not able to step down from our cars as we realised what a monsoon trek really means. We were asked to reduce our baggage. With rain lashing around us,we filled our tummies with bread with a heavy fight within us for jam and milkmaid and we had spectators watching us ( the great monkeys ).Got a lot of inspiration from Atul ji who was walking with his slippers instead of shoes .Then came a stretch of plains and a small dam and the easiest part of the trek the JEEP TRAIL. We heard some sooper history classes about the JEEP TRAIL from Arun which made our walk more easier. We regrouped at a point which was EOT( 😛 nothing much but end of trail). 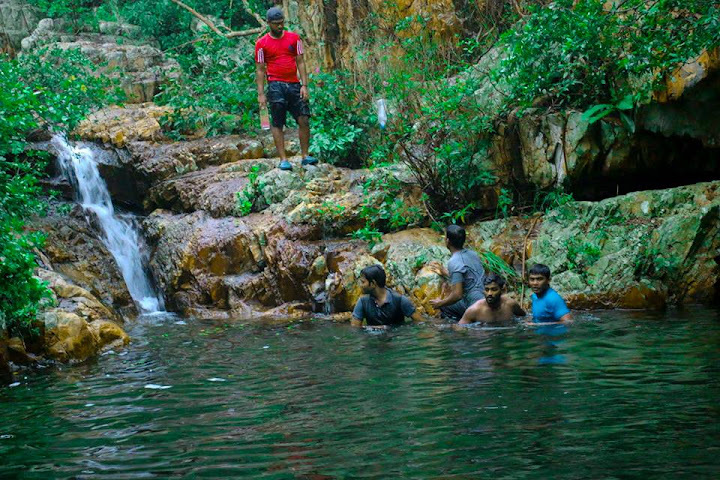 We deviated from the JEEP TRAIL, and headed to the pool.Our enthusiasm increased as Tada looked like Meghalaya —- misty and the cloudy —-, our guide mainly Shravan’s orange rain coat. As per the plan we must have claimed up and down two ridges, but we climbed the third, next came the fourth ridge, hiking the ridge was easywith the excitement to see the pool…….Each minute became longer and longer but the pool was nowhere????? ?After sometime the urge in our brain got down to the urge of our tummies. So we sat down at a hill top for lunch again with no excuse by the rain. The professionals were in a heavy discussion and finally decided to walk down along the stream(Actually moving in the stream :P) . There was very little water in the stream. With the spirit of “when you fall get up oh oh and if you fall get up yeah yeah” we reached the pool with the help of some other trekkers giving directions. There came the first pool which made us believe that we were again in our right path. After some swimming we started again to see the main waterfall but surprisingly got a beautiful view of a waterfall in the middle, which is very rare and a sight only during monsoon. After some more walking, atlast ,……… oh what a sight ,…………of the“the main waterfall”. With a sense of achievement we started swimming and even did some diving from the top(Actually a scary thing for me :D). It was about 4.30 pm when the organisers decided to pack us from there to our way down. We couldn’t make it to the watch tower as the rain and the time both were pushing us towards our base. Mist made our walk more difficult ( when we were just getting used to walking in rains). Regrouping again we went on with our search for the JEEP TRAIL. We moved down as soon as possible but couldn’t make to the JEEP TRAIL before sunset. Here is where our organisers took the lead. With the help of only 6 or 7 torches for 30 of us, using words as our lights indark and able guidance of Arun, we reached the JEEP TRAIL and finally saw light at our car park. With no limits for our joy and no words to express the entire experience ,……….. strangers becoming friends in no time ,….,……….our two day trek entered the third day when we reached our homes. Thanks to all volunteers, the team and CTC for making this weekend and Diwali so memorable. See you all soon again. 8th October, 2015 will be one of my most memorable days. 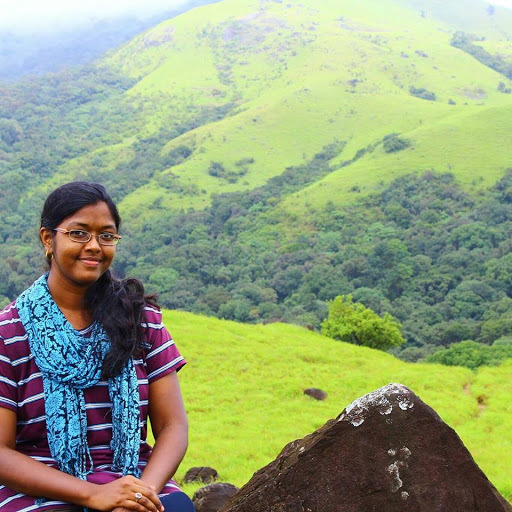 The day, I did my first trek. The experience was amazing and never forgotten. 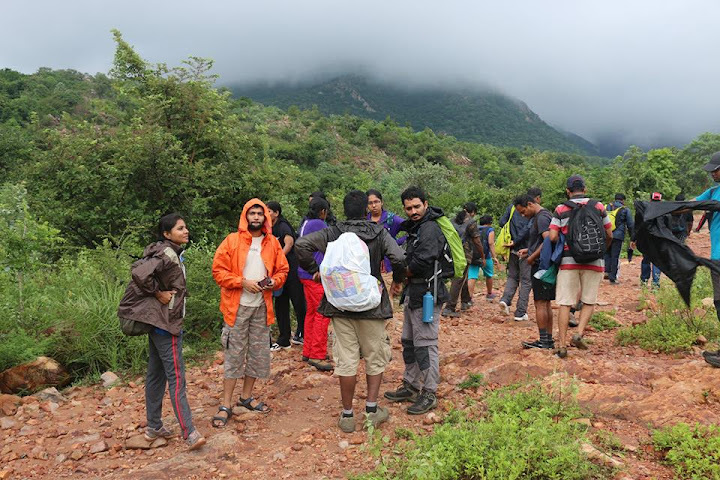 All adventures in one day – Trekking under heavy rain, uphill, downhill, rock climbing, terrain, fog, falls, night trek, slippery route and meeting with some awesome people. I had passed through all type of emotions in one day. Thanks to CTC club for this terrific experience. I was following CTC club for long time but never been able to tag along with them on their amazing journey. 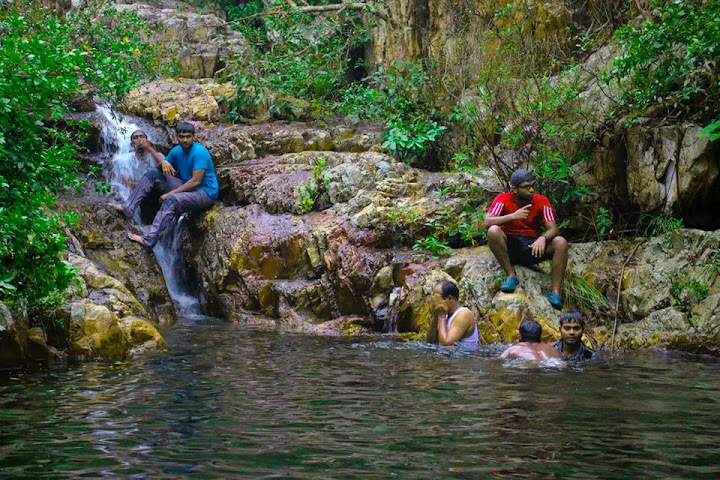 Finally when I saw the post for one day trek at Tada Falls, I didn’t think twice and registered quickly. I was super excited to go to my very first trek, to meet all new people. The feeling was like leaving the comfort and cozy zone, and being free in the wide wild. The journey starts on 7th October afternoon. The first person I met was Vetrik who was also one of the new comers like me. 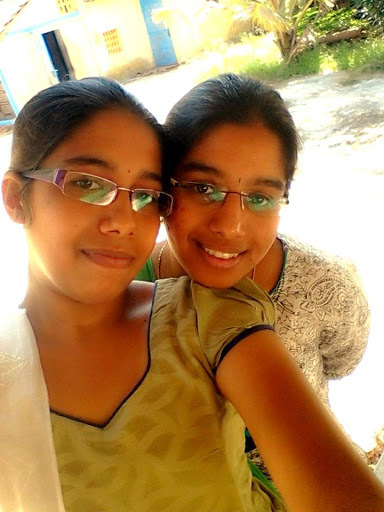 We drove and picked 3 other persons, Swathi, Inayath and Vinoth, who shared their experience with CTC club. Total 32 individuals headed towards Tada falls. When we were about to reach Base camp, we stopped the cars in middle of nowhere. It was dark night with full of stars in the sky. The view was beautiful. We reached the Base camp around 11 pm. We were arranging ourselves to go to sleep, when the rain started pouring heavily and I realized that I should have bought a sleeping bag! We started for trek around 6:30 AM. We were just having our breakfast, and there they came. MONKEYS!!! And started snatching foods from our hands. Somehow we managed to finish our breakfast and started walking towards the destination. While we were walking only few meters, Mr. Arun, the Explorer, he already reached the top of the hill. HOW DID HE DO THAT!!! We were blindly following him. The view from the top was amazing. The fog made the forest mysterious. We walked around 2-3 hours [not sure how long], when we found out that there is no trails to reach the falls except climbing the hill. So the rock climbing started. In between rain also started. After few hours of climbing and walking, we came to know that we lost the track. By that time we were already tired and hungry. We sat and had our lunch there, where Arun found the route. We had to find and follow the water stream. We started trekking in search of water stream. Thanks to Mr. Ramesh who helped me a lot in this path. The path was slippery, full of loose rocks. I fell down couple of times. Finally we reached the lake. I couldn’t resist myself from swimming in that crystal clear water. But that was not our destination. We hadn’t reached yet to the main falls. We reached the main falls around 3:30 PM. The place is so beautiful and quite. We played in the falls for 1 hour and started around 4:30 PM. While descending, it became dark. It was so hard to trek at night. Everywhere loose and slippery rocks with sharp downhill. I was feeling dizzy, tired, my knees were shaking like disco diva and damn afraid that I might not reach home in one piece. I fell down several times. My legs were not responding. Thanks to Arun, Praveen, Dinesh, who helped me a lot while coming down. 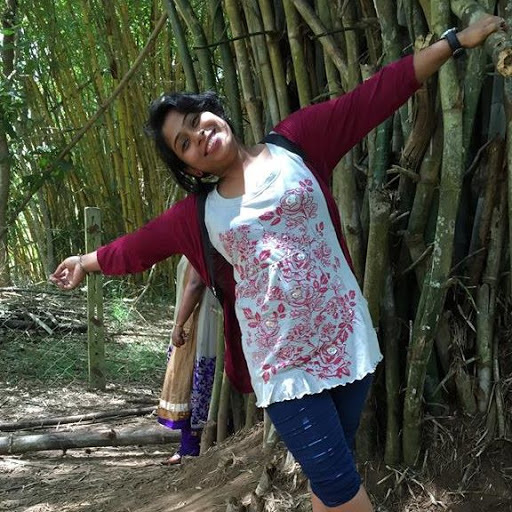 The chat with Arun and Praveen on the way down helped me to forget the pain for sometimes. Finally we reached the Base camp at 8:30 PM. On the way home, we had our dinner in a road side dhaba, and the food was like Amrita. I reached home at 2 in the morning with full body pain, scratches, bruises and a mind blasting experience. Arun: The Explorer. Hats off to his energy and encouragement. Praveen: One of the most energetic but clam person. Ramesh: One of clam and nice person who helped a lot during trek. And Finally the Team: Thanks for the amazing memory.